Leading a creative process to foster innovation within diverse teams proves to be challenging for Heritage in today’s context, not only the curators themselves but also the engineers, designers and marketers who work with them. Whatever the period, place, environment or context is, the only way to survive is to innovate. This concerns both commercial organizations and public structures, both start-ups and hundred-year-old companies. All this is no less true for countries, cities, political institutions which all depend on renewal to survive in a world in perpetual movement. 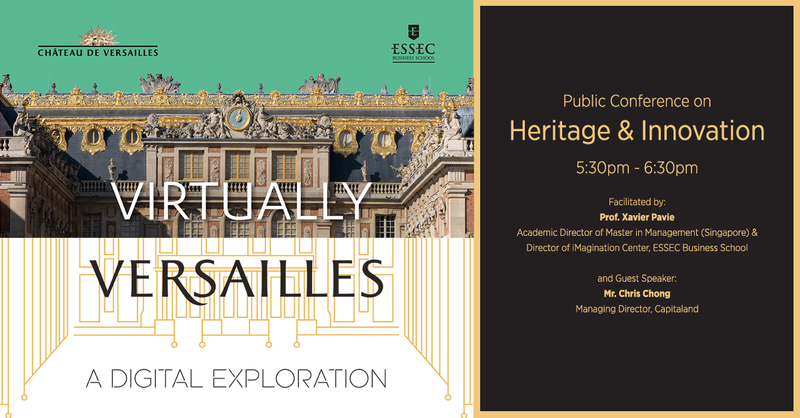 The purpose of this conference is to highlight the stakes of innovation and more particularly how innovation makes sense for both historical and traditional structure of more than 400 years old which is the castle of Versailles, and for slightly over than 50 years old country, the city-state of Singapore. Animation and moderation by Professor Xavier Pavie, Academic Director Master in Management in Singapore and director of iMagination Center.